How was your weekend? Mine was wonderful. I had a divine time attending a concert held at my church. The church has been constructed to replicate an English Cathedral with the most beautiful acoustics. The Arias and Instrumental Classics were amazing.The theme of the concert was French music. Wow! The weather in Northern California has been outstanding this year. Hopefully the rain will be coming in this week. Our yard is very large and the automatic watering system has not be checked by (Mr. Water Man) Sweetheart to all of you in blogland. He is wonderful about keeping the sprinklers and drip system in tip-top condition all summer long. As you know we have temperatures ranging from 30 degrees or below in the winter to 118 degrees and above in the summer months. I love to garden and WATER IS GOLD. 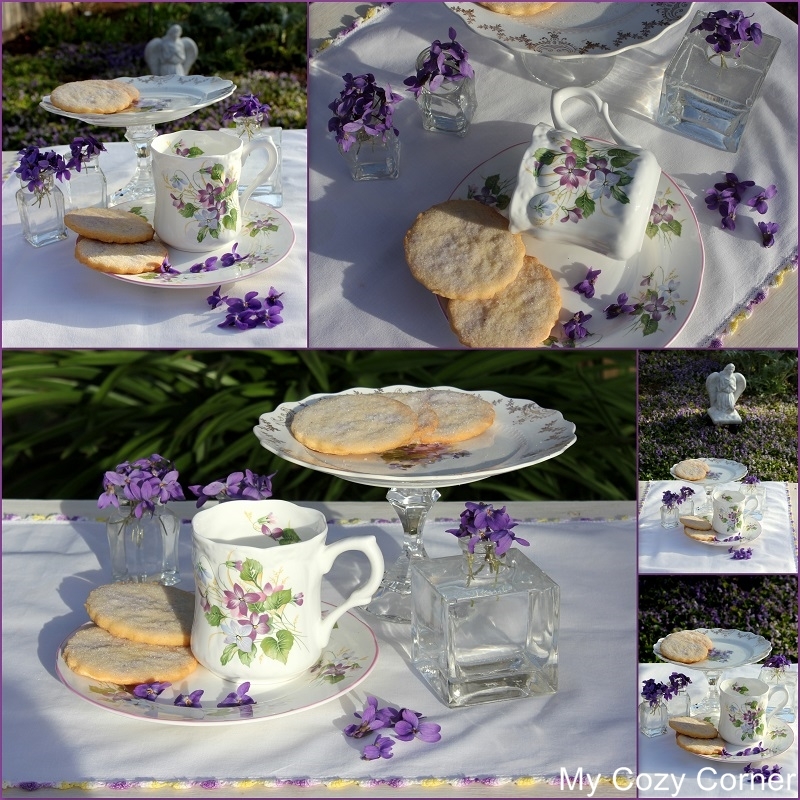 The tea cup and saucer are REGENCY Bone China and Made in England. The pedestal dish is a thrift store vintage Sterling dish attached to a candle holder with E6000 glue. The angel is sitting in the middle of a bed of Johnny-Jump-Ups. I picked a few violets to place in the vintage bottles, and a few to scatter on the vintage dresser runner. The hand made runner is trimmed with yellow and purple crochet edging. The violets have been on this property since we bought it 45 years ago. I have dug them up and covered them up, but they are the most resilient plant in my garden. After all these years, now I want them to grow. Are there anything more lovely than violets? It does not matter, if they are on china or real ones. Your beautiful vignette is so carefully done and what a wonderful idea to transform a plate and candle holder into a darling cake plate (may have to steal that one, some day!). Thanks for sharing your beautiful garden! Beautiful teascape! I love violets and to be able to photograph this outside in your garden in the sunlight ... extra special! Happy Tea Day! How lovely! I love the JJUs too. A We had them in quite a patch of the front and a neighbor told my honey they were weeds and to get them out, so, unbeknownst to me, he took the neighbors advice and killed them. I miss them! I really hope they come cack. They were such a lovely sign of spring! Your china is lovely! Thanks so much for linking to Tuesday Cuppa Tea! My...How lovely! What a Spring, "breath of fresh air" your blog post is! 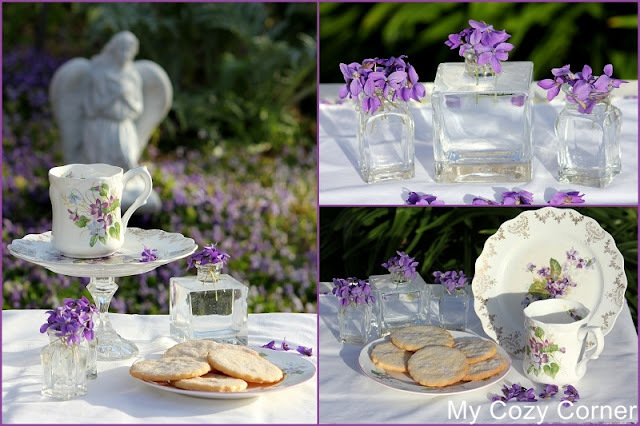 Love your sweet violets, pretty china and teatime vignette that is set out so beautifully in the garden... The French music concert in your cathedral sounds like it was truly divine to listen to and enjoy! Your violets are beautiful, both the ones in your garden and the ones on your teacup! Lovely and so springy! You are so BLESSED to have a sea of violets. Lovely tea set and table set for tea. Cookies look so yummy and your china is darling. Your outdoor tea with fresh violets and pretty china is lovely. I like sugar cookies too, simple and buttery and can be cut into any shape. Oh what a darling post - I think you made us all feel spring is in sight! Thank you so much for linking to Friends Sharing Tea! Sweet violets.....ahhhh. Are you missing a cookie? Your JJUs are so sweet and so is your china. I love the cup! Your cookies look as light as air and would taste wonderful with a cup of tea. Pretty plate too. Thank you for coming to tea and enjoy the rest of your week. Vad härligt att ni har fint väder här har det varit sol och varmt men nu blir det lite kallare dagar men solen är kvar. Snön börjar också att försvinna och jag har köpt hem första vårblommorna till balkongen. Än är det mycket snö på kolonin..